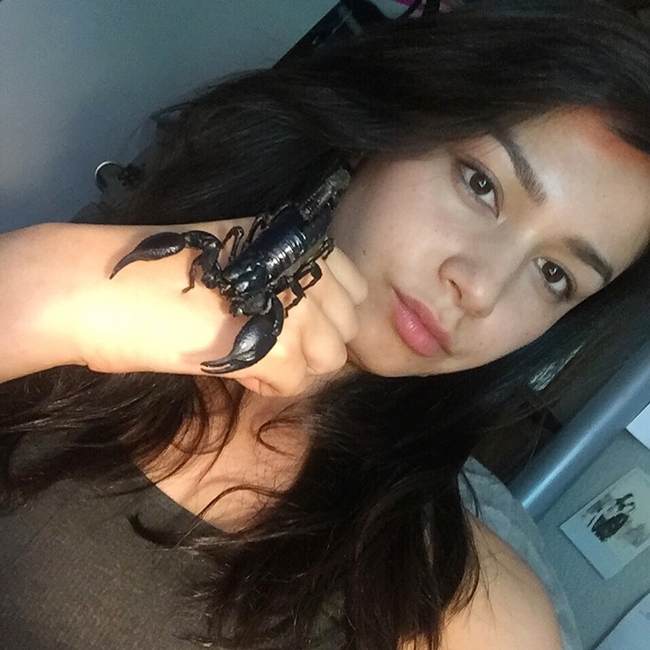 UC Davis animal science major Ivana Trinh Satre, who hopes to become a veternarian, holds one of her scorpions. If you walk into the Bohart Museum of Entomology at the University of California, Davis, you might see UC Davis student Ivana Trinh Satre entering moth data on the LepNet database. It's a database but she also has a fan base. 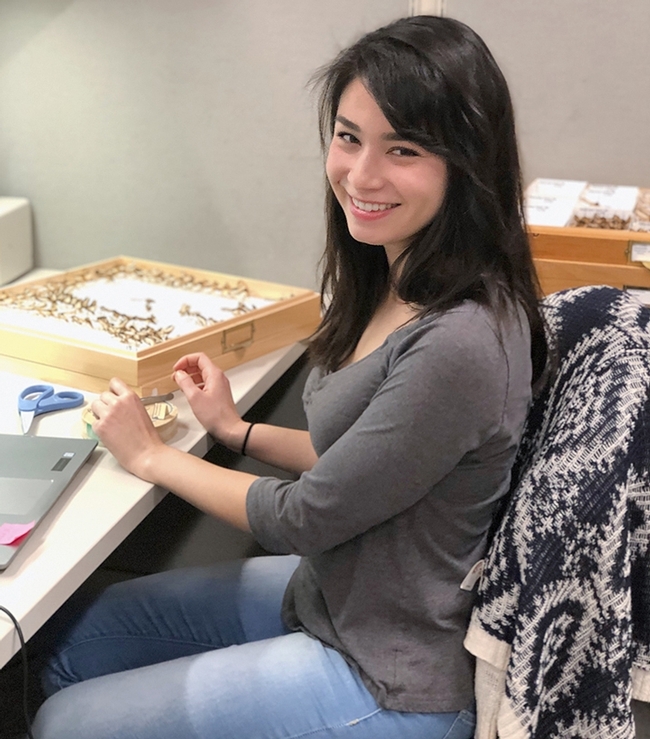 Ivana is entered in the Miss Vietnam Northern California/Miss Vietnam Sacramento Pageant--and entomologists, fellow insect enthusiasts, classmates, family and friends are rooting for her and hoping she wins. Ivana is one of 14 candidates in the Sacramento-based pageant. The overall winner will be named Miss Vietnam Northern California and the second-place winner, Miss Vietnam Sacramento. The winners will be determined by People's Choice or online voting (open to all). Voting ends at noon, Pacific Time, on Saturday, March 23. The pageant itself takes place from 3 to 7 p.m., Sunday, March 24 at 6200 McMahon Drive, Sacramento. Entering a pageant is new to her but this one is special. “I am half-Vietnamese, half-white,” Ivana related. “My mom escaped Vietnam and stayed at a refugee camp in Malaysia for a few years before finally coming to the United States in 1984.” Her father is a computer engineer and her mother, the activities coordinator at a senior living center. Ivana is one of four children; she has an older and younger brother, and a younger sister. “Right now, I am a fourth-year animal science major and medical-veterinary entomology minor at UC Davis," Ivana said. “I enjoy learning about all animals, including arthropods." In addition to working at the Bohart Museum, she's an intern at an animal hospital in south Sacramento. Her resume includes such previous positions as spay and neuter volunteer for the Yolo County Animal Service, research volunteer at the UC Davis Meyer Avian Facility, research volunteer at the UC Davis feedlot, and hospital volunteer at Kaiser Permanente. Ivana plans to receive her bachelor of science degree in animal science this spring, and then will apply for vet school this summer. "I plan to work as a vet assistant during my gap year." The LepNet database is aimed at integrating millions of Lepidoptera occurrence records, and the Bohart Museum is one of the museums involved in the project. The Bohart Museum, directed by Lynn Kimsey, professor of entomology at UC Davis, houses a global collection of nearly eight million insect specimens, including 500,000 in the Lepidoptera collection alone. Ivana is active in the UC Davis Entomology Club, and currently serves as the media coordinator. “I currently have two pet scorpions, two tarantulas, a centipede, Madagascar hissing cockroaches, and goldfish. I also have a ton of succulents and houseplants." Once she's settled into a career and larger apartment, Ivana hopes to add a dog, some reptiles and "of course, more bugs." When she's not studying, LepNet databasing, or interning at the animal care center, Ivana enjoys hiking, cooking, baking, playing the flute, and spending time with friends and family. Meanwhile, the People's Choice voting is underway, one vote per IP address (which means votes can be counted on separate devices, such as a cell phone and a laptop computer). Click here to vote: https://www.surveylegend.com/s/1bxp (The UC Davis student is No. 2 on the list.) Folks can find more information about the pageant by accessing Facebook at https://www.facebook.com/MissVietnamNorthernCalifornia/. From UC Davis animal science major to Miss Vietnam Northern California?